Although changes may not have been made to the physical building over time, changes to the list of building emergency personnel, their phone numbers, and the list of “persons requiring assistance” (PRA’s) may very well be outdated. It is the responsibility of building owners and their selected management agency (including business operators) to ensure the safety of their occupants in the premises. Preparations are to be made for the safe evacuation of PRA’s from each building during a fire emergency, these being industrial, commercial and residential buildings. Specific procedures are to be developed and approved by the Fire Chief prior to being implemented. 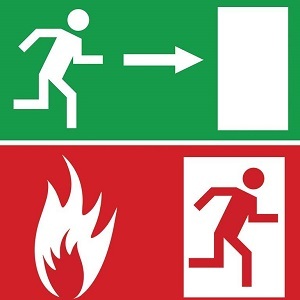 In some cases, evacuation procedures are formulated based on the physical resources in a particular building. In other buildings, procedures are arranged to stage persons needing assistance in areas of refuge, where they are to await further assistance in evacuation. Care occupancies, care and treatment occupancies and retirement homes undergo a comprehensive assessment to establish the appropriate level of staffing to effectively implement the fire safety plans evacuation procedures. The list of PRA’s is to be kept current at all times, with a copy placed in the fire safety plan and a copy readily available for presentation to the arriving emergency services personnel. This list indicates the occupants and/or employees who are in the category of persons who will require assistance during a fire emergency. It includes names, phone numbers, and expected location, as well as the reason for and the nature of the required assistance. As a starting point in creating this list, some building operators and managers arrange to meet all persons who would require assistance during an emergency, so as to discuss and review the emergency procedures and determine the best options for each person’s evacuation. The process may start by asking each tenant or employee to complete a questionnaire, in order to bring further awareness as to any need(s) for assistance. The building management would then be able to establish and document those persons requiring assistance, including persons using wheelchairs, scooters, crutches, those having hearing impairments or who have had recent surgery or broken limbs within the past 6 weeks, etc. As a requirement for implementation of the fire code, it is critical that PRA’s are accounted for, from the start of their building evacuation through to their arrival at a safe assembly area as designated in the approved fire safety plan.